WASHINGTON — Lebanon is almost tearing apart at the seams , and the current Lebanese government is trying to stop it. But, it seems that it is too little, too late to maintain the fragile Lebanese peace to endure just a little longer. Reuters reports  that the Lebanese government will try to secure parts of the country where violence threatens to destabilize the entire country. 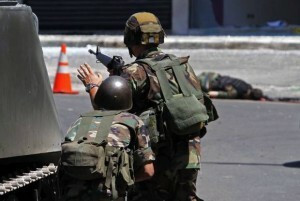 12 soldiers were killed in the ensuing firefight, but there were a total of 22 bodies that were pulled out of the complex. The radical cleric, Ahmed al-Assir, is suspected of inciting sectarian violence within Lebanon and whose gunmen used civilians as human shields  when fighting the Lebanese army. The Lebanese public is afraid that this is the beginning of a spillover effect from the 2-year-old Syrian civil war and is entering a country whose peace is fragile as it is. Hezbollah, an Iranian-backed terrorist organization, has entered the civil war on the side of the Syrian government regime led by Bashar al-Assad and killed one protester  outside the Iranian embassy in Lebanon.